Our Shoe Trees are Made of 100% Aromatic Red Cedar. Our kiln dried & highly sanded Shoe Trees NEVER split or splinter & have a wonderful cedar smell. Best of All -- our Shoe Trees are GUARANTEED FOR LIFE! Added Wear. Aromatic Cedar Shoe Trees protect the leather, fabric, stitching and soles from moisture damage, adding to their life. Cedar's unique wicking action quickly absorbs moisture, acid and salts, thereby reducing cracking and deterioration. The Washburn men's cedar shoe trees are hand-crafted and hand-sanded, with a high vamp toe and attractive brass-plated knob on the heel. Designed to exert pressure from heel to toe in a variety of shoe styles. They straighten the insole as well as the outsole, pulling wrinkles out of the linings and vamp. Absorbs damaging moisture and salts. If you are between sizes, always go up to the next size. Available in men's sizes 6-14 1/2. Sold as a pair. The men's cedar boot trees combine the unique Western boot toe with the full coverage of a hook heel. Aromatic Cedar Boot Trees are essential for maintaining the look and fit of Western, Contemporary and Traditional boots. Absorbs damaging moisture and salts. Sold as a pair. Men's sizes 6-16. The Premium Cedar Shoe Tree is very impressive . The European design features an expandable full crown and fully contoured heel with a polished brass knob for ease-of-use. Grasp the knob while pushing toward the toe of the shoe when inserting or removing the tree from your shoes.. Designed to exert pressure from heel to toe in a variety of shoe styles. They straighten the insole as well as the outsole, pulling wrinkles out of the linings and vamp. Absorbs damaging moisture and salts. If you are between sizes, always go up to the next size. Available in men's sizes 8-14. Sold as a pair. St. Paul Cedar men's shoe trees feature a hand-sanded, classic solid-toe with a distinctive brass-plated knob on the heel. Designed to exert pressure from heel to toe in a variety of shoe styles. They straighten the insole as well as the outsole, pulling wrinkles out of the linings and vamp. Absorbs damaging moisture and salt. Sold as a pair. Available in men's sizes 5 - 14 1/2. Elite men's cedar shoe trees by Rochester are split-toe shoe trees, designed to exert equal pressure in all directions. Automatic toe spreader to accommodate varying widths and toe shapes. Absorbs damaging moisture and salts. Works great for a wide range of sizes, including many hard-to-fit widths. Features a handsome brass-plated knob, combined with a split toe. Sold as a pair. Men's sizes 4-1/2 - 17. Rochester Men's Cedar Western Boot Trees are designed to fit the unique shape of a western boot. Solid cedar toe and heel with a rugged, convenient rawhide loop. Keeps boots looking newer by eliminating wrinkles, and by keeping the forepart of the boot in its original shape. Absorbs damaging moisture and salts. Sold as a pair. Available in men's sizes 6-18. O'Hearn Men's cedar shoe trees by Rochester are designed to exert pressure from heel to toe in a variety of shoe styles. They straighten the insole as well as the outsole, pulling wrinkles out of the linings and vamp. Absorbs damaging moisture and salts. Classic, solid-toe with easy-to-use full cedar hook heel. Men's sizes 6-1/2 - 16. Sold as a pair. 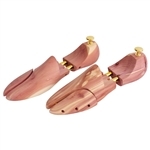 The Woodard men's cedar shoe trees are our most popular shoe trees. They combine a classic, full cedar hook heel with a practical split toe. Automatic spreader adjustment means a perfect fit in every shoe. Designed to exert pressure from heel to toe in a variety of shoe styles. They straighten the insole as well as the outsole, pulling wrinkles out of the linings and vamp. Absorbs damaging moisture and salt. Rochester split-toe shoe trees work great for a wide range of sizes, including many hard-to-fit widths. Sold as a pair. Available in men's sizes 4-1/2 to 17. The men's Rancher cedar boot trees combine the travel tree heel, with the Western boot toe, for an economical man's Western boot tree. Absorbs damaging moisture and salt. Available in men's sizes 6-16. Sold as a pair. The Clinton men's cedar shoe tree combines a classic, solid-toe with an easy-to-use full cedar hook heel. Designed to exert pressure from heel to toe in a variety of shoe styles. They straighten the insole as well as the outsole, pulling wrinkles out of the linings and vamp. Absorbs damaging moisture and salts. Rochester solid-toe shoe trees have been setting the standard for the highest quality traditional shoe trees for over 75 years. Sold as a pair. Available in men's sizes 4 to 16. The Men's Sir Alton cedar shoe trees feature a split-toe and a genuine, rawhide looped heel for easy removal and storage. Designed to exert pressure from heel to toe in a variety of shoe styles. They straighten the insole as well as the outsole, pulling wrinkles out of the linings and vamp. Absorbs damaging moisture and salt. Rochester split-toe shoe trees work great for a wide range of sizes, including many hard-to-fit widths. If you are between sizes, always go up to the next size. Sold as a pair. Available in men's sizes 4 1/2 - 17. The Mohawk men's cedar shoe tree is our least expensive split-toe full cedar shoe tree. Features a pistol grip heel. Designed to exert pressure from heel to toe in a variety of shoe styles. They straighten the insole as well as the outsole, pulling wrinkles out of the linings and vamp. Absorbs damaging moisture and salts. If you are between sizes, always go up to the next size. Available in men's sizes 6-17. Sold as a pair. Baker II men's cedar shoe trees by Rochester are designed to exert pressure from heel to toe in a variety of shoe styles. They straighten the insole as well as the outsole, pulling wrinkles out of the linings and vamp. Absorbs damaging moisture and salts. Features a solid cedar toe and a plastic handle. Sold as a pair. Men's sizes 6-1/2 - 16. The Hale men's cedar shoe tree features a solid toe with a rawhide loop heel. Designed to exert pressure from heel to toe in a variety of shoe styles. They straighten the insole as well as the outsole, pulling wrinkles out of the linings and vamp. Absorbs damaging moisture and salts. Rochester solid-toe shoe trees have been setting the standard for the highest quality traditional shoe trees for over 75 years. Sold as a pair. Available in men's sizes 4 to 16. Men's Yankee Cedar shoe trees have a solid cedar toe with a cedar pistol grip heel. Designed to exert pressure from heel to toe in a variety of shoe styles. They straighten the insole as well as the outsole, pulling wrinkles out of the linings and vamp. Absorbs damaging moisture and salt. Sold as a pair. If you are between sizes, always go up to the next size. Available in sizes 6 1/2 - 16. Cedar Western Boot Shapers are ideal for maintaining the shape of dress and English riding boots. Made from solid cedar with a distinctive, brass-plated knob for easy removal. Absorbs damaging moisture and salts. 14" tall. One size adjusts to fit both men's and women's boots, sizes 6 to 12. Men's travel cedar shoe trees are just right for business trips and vacations. Absorbs damaging moisture and salt. Combines a split, cedar toe with a light-weight plastic handle. Rochester split-toe shoe trees work great for a wide range of sizes, including many hard-to-fit widths. Sizes 4-1/2 to 17. Sold as a pair. The men's Euro cedar toe shoe trees feature a solid toe. Designed for European-style comfort shoes. Features a rawhide loop on the heel. Designed to exert pressure from heel to toe. They straighten the insole as well as the outsole, pulling wrinkles out of the linings and vamp. Absorbs damaging moisture and salts. Sold as a pair. Available in men's sizes 6-1/2 to 13. The men's Sierra cedar shoe tree has a special toe shape that allows use across a wide range of sizes. Designed to exert pressure from heel to toe in a variety of shoe styles. They straighten the insole as well as the outsole, pulling wrinkles out of the linings and vamp. Absorbs damaging moisture and salt. Sold as a pair. This tree only comes in one size - 8 wide to 12 narrow. Men's plastic shoe trees help to retain the original shape and life of your shoes. Lightweight and unbreakable. 1 pair. Color will either be Dark Brown or Cordovan, depending on what is in stock. One size is adjustable from sizes 6-13. Men's Cedar Boot Trees with Square Toe are designed to fit the unique shape of Western boots with a square toe, and help maintain the shape. Cedar boot trees absorb damaging moisture and salts, making boots last longer. Good for Western, Contemporary and Traditional boots. Rawhide loop at the end makes for easy storage. One pair. Made in USA. Available in men's sizes 6-14. Griffin men's plastic shoe trees help to retain the original shape and life of your shoes. Lightweight and unbreakable. 1 pair. Color will either be Dark Brown or Cordovan, depending on what is in stock. One size is adjustable from sizes 6-13.